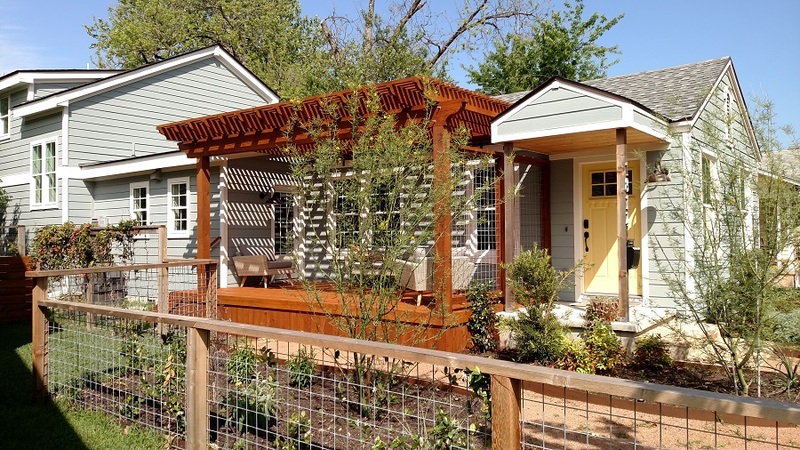 Can an outdoor living space be small in scale and still be GRAND? You’d better believe it! Today’s project, located in the Steiner Ranch community of Austin, TX, drives that point home with certainty. This may not be the largest outdoor living space we have designed, but it’s unique — and one of our favorites. 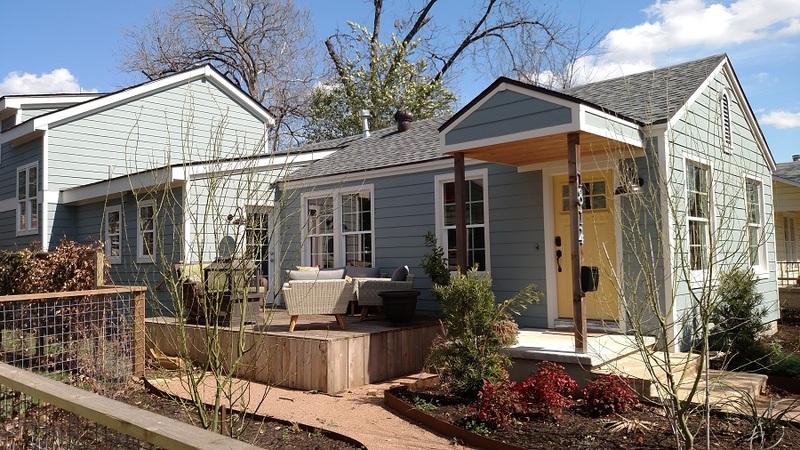 To start, a basic concrete patio was the only outdoor living space existing at the home. 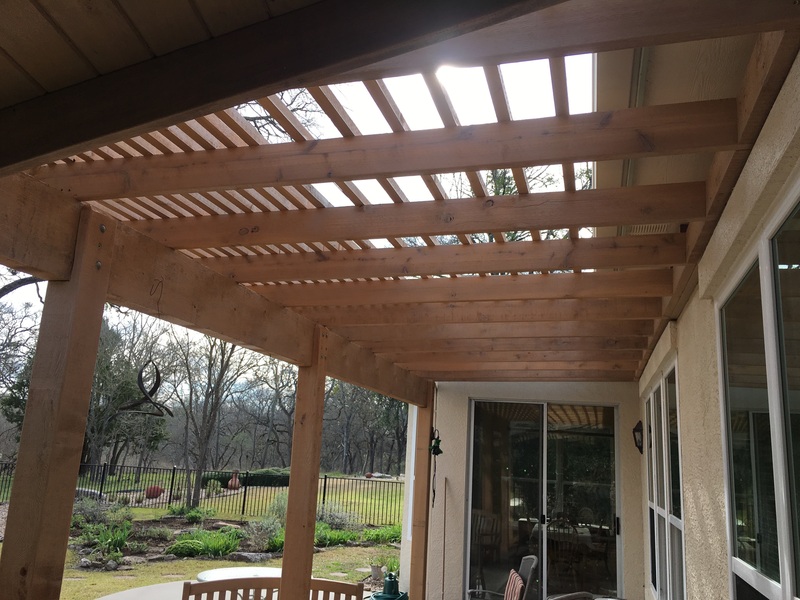 Standing in the back yard, facing the patio and the back of the house, the homeowner looked up … and knew she wanted to add a pergola over the patio and a deck off of the second-floor bedroom. She also knew she didn’t want a typical deck staircase extending from the deck out into the yard. Whether a straight staircase or one that turned at a landing, either kind would be too prominent, visually, and would take up way too much space. It would stick out. A spiral staircase was what she wanted. OK! 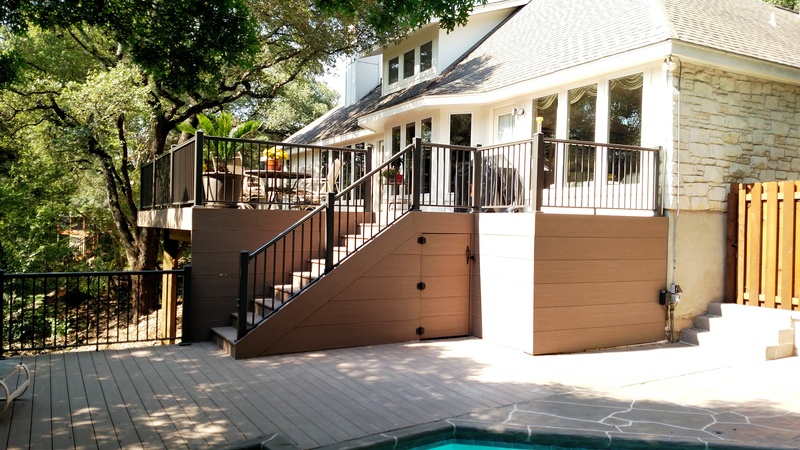 Archadeck of Austin is all in favor of spiral staircases, but they can be expensive. We did some research online and finally located an affordable spiral staircase by Salter Spiral Stairs. We were hesitant to order it, though, because it comes as a kit. First you go through Salter’s design consultation process, giving them the measurements of your space. Then Salter creates your staircase and ships it to you in pieces — along with installation instructions. If you have any trouble with it, they provide customer service reps who can answer your questions by phone. Based on our experience in the world of DIY, some kits are good and some are not. We decided to take a gamble that this spiral stair kit would be satisfactory. It was GREAT! The staircase installation was seamless, and we are all pleased with the staircase quality. 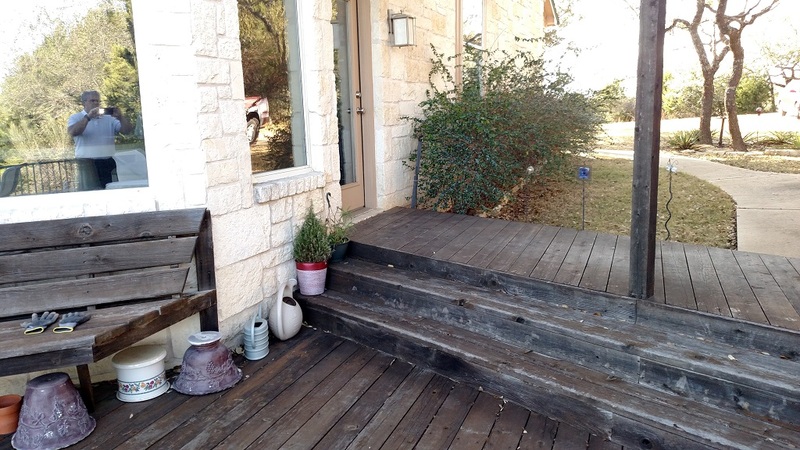 We even got an upgrade to include welded stair treads, which add a great deal of character to the stairs. 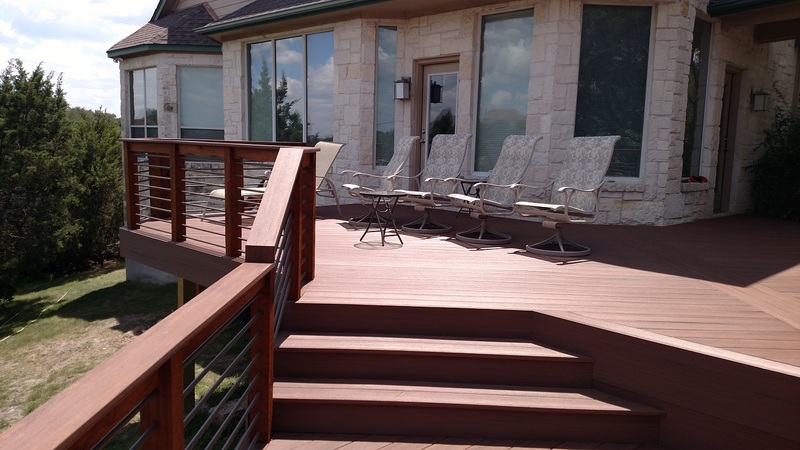 We built the second-story deck with AZEK low-maintenance composite decking in a dark hickory color. 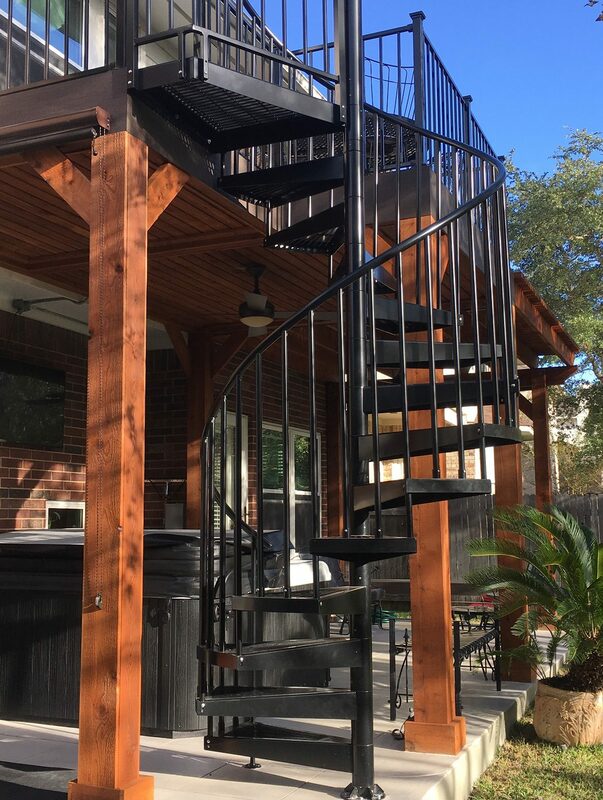 The deck railing is a black metal railing from Fortress, and it goes perfectly with the black metal spiral staircase. 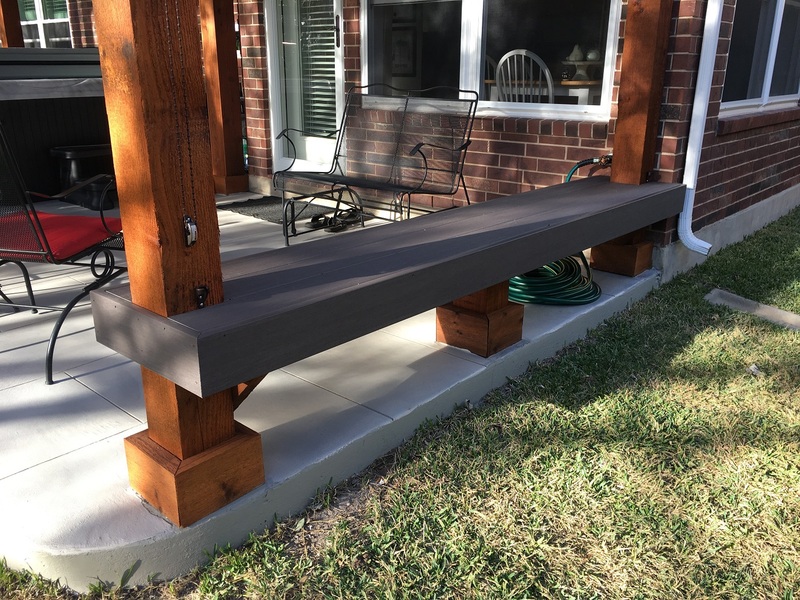 Finally, we custom-made a bench using AZEK dark hickory composite decking to provide additional seating along one end of the patio. 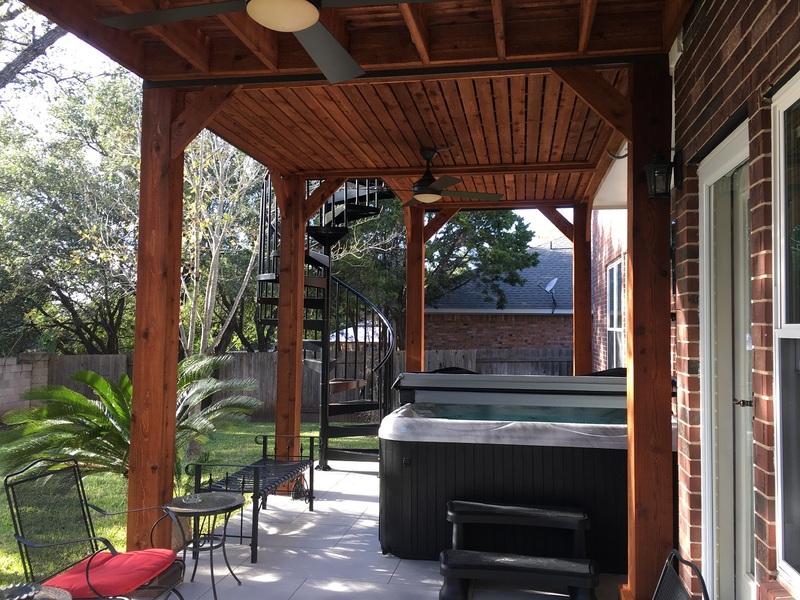 Altogether, this combination outdoor living space now includes the original patio plus a new cedar pergola and composite deck — topped off with a spiral staircase, which is like eye candy! 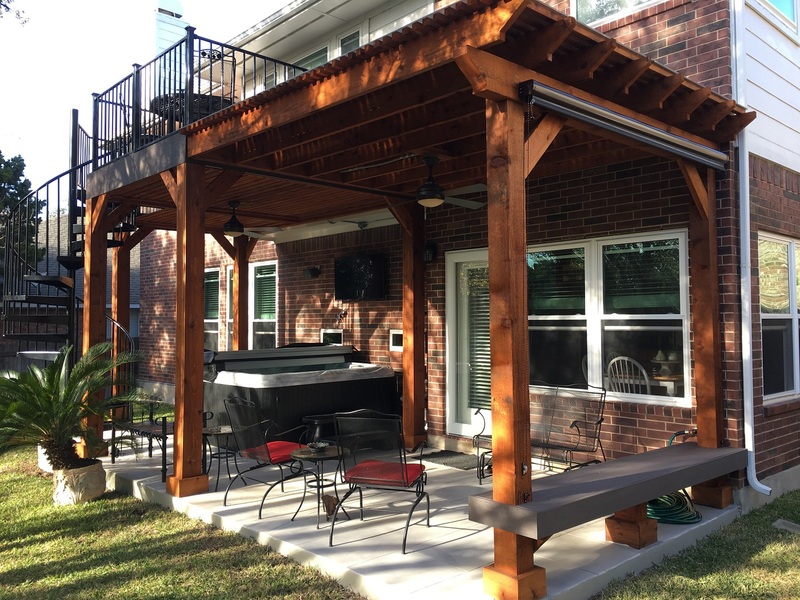 To support the pergola and deck, we built sturdy cedar posts matching the cedar pergola. 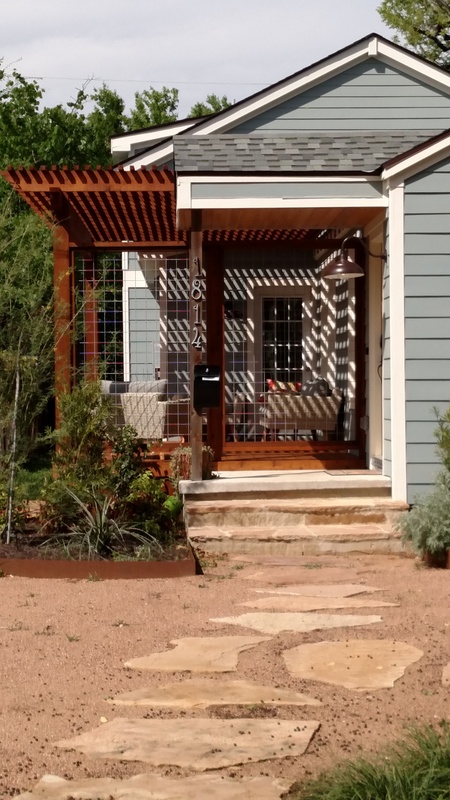 We also added a Polygal cover on top of the pergola to protect patio sitters from sun and rain. The scene is complete with ceiling fans over the patio and light fixtures for nighttime use. Taking it all in at once, you can see we packed a lot of outdoor living design into a relatively small space! It all works together well without crowding or giving you that penned-in feeling. 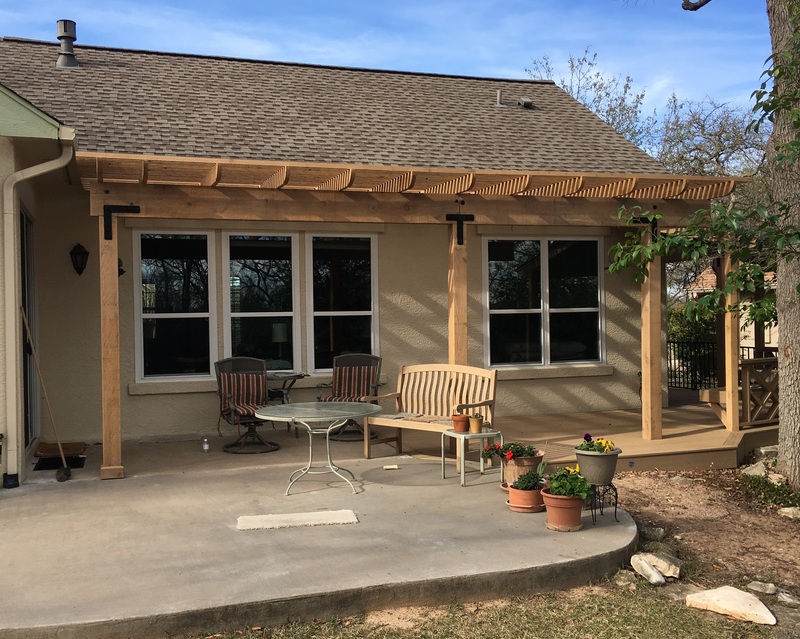 This Steiner Ranch combination deck and pergola project, with patio, demonstrates that an outdoor living project doesn’t have to be massive in scale to be effective. 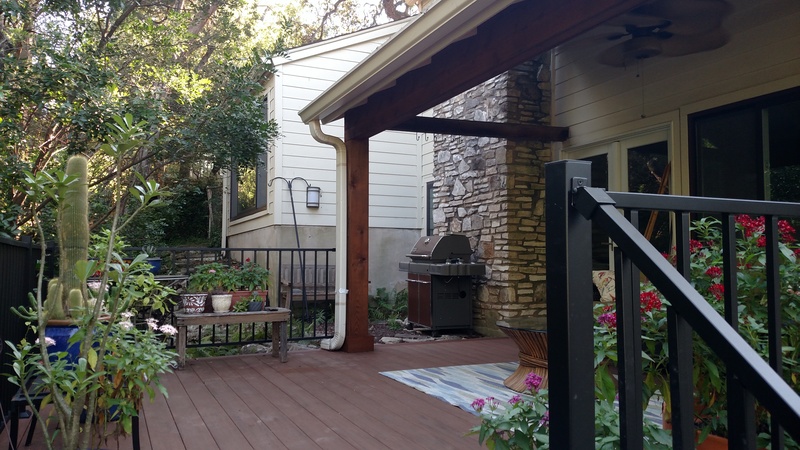 Let us show you how to make the most of the outdoor space you have. And if you want a spiral staircase for your deck, we know just the one! 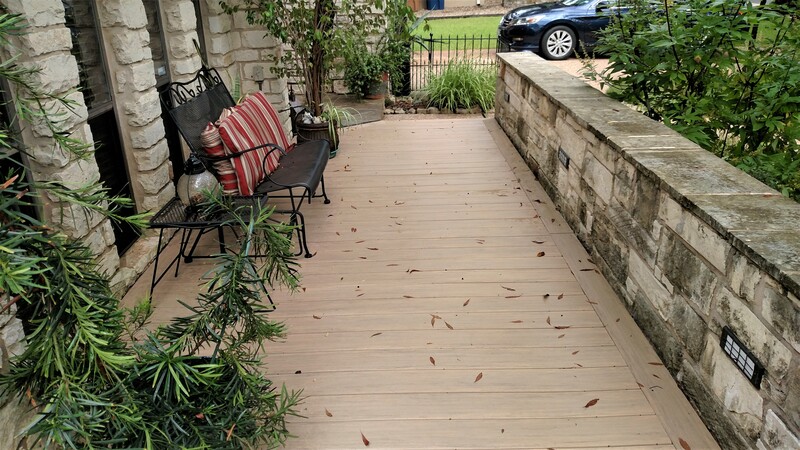 Contact Archadeck of Austin today at (512) 259-8282 or via email at jim.odom@archadeck.net to schedule a free design consultation. Archadeck of Austin asks: Are you ready to drive home a new deck? 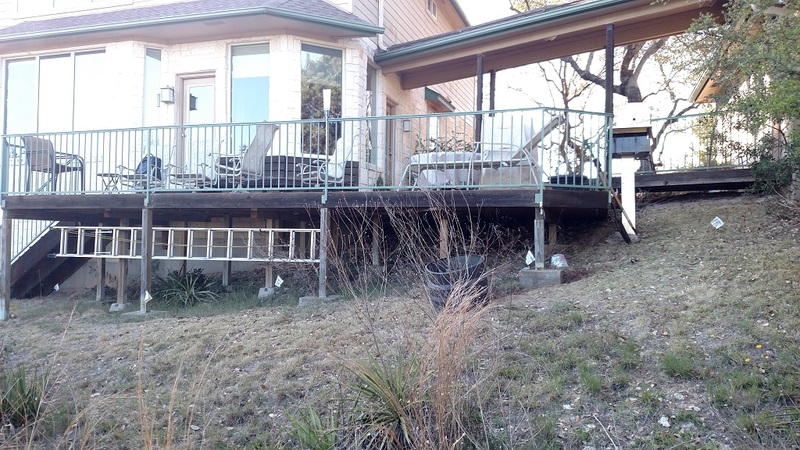 Replacing a deck at your northwest Austin home can be somewhat like getting a new car. Your old one seemed fine; you have a history together and you’ve overlooked its quirks. However, as soon as you step into the new one – wow! 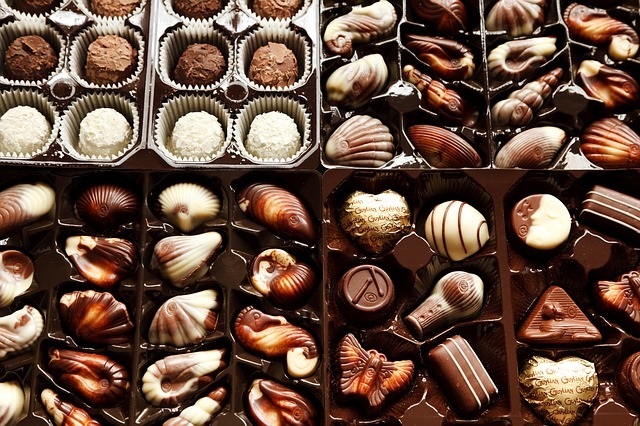 The difference is astonishing, and now you can see what you’ve been missing. 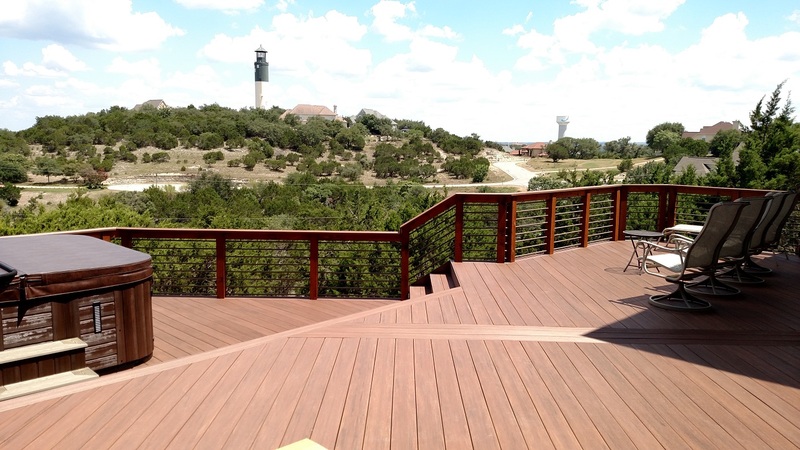 That comparison comes to mind when you see the before and after pictures of this large outdoor living project that Archadeck of Austin recently completed in the Cat Mountain North area. 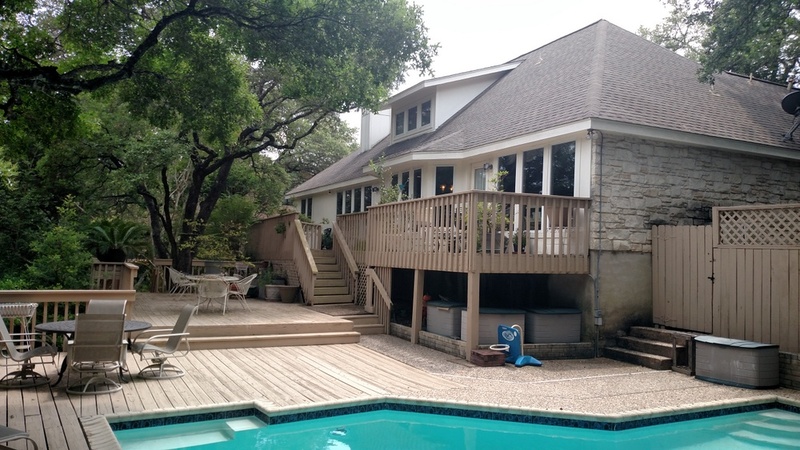 The original deck was split into two levels overlooking the back yard and swimming pool. The homeowners had decorated each level attractively with potted plants, and overall the space had a comfortable appeal. 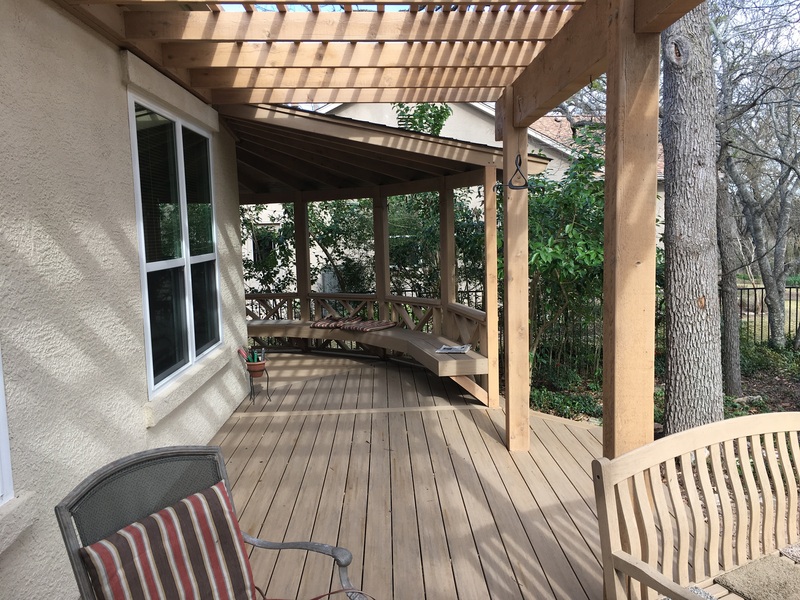 The deck was “fine” over the years, but there were three problems with it that we were able to address when we designed the replacement deck. First, neither of the two deck levels was quite large enough. The two separate spaces were a little cramped and not conducive to entertaining or sitting and visiting with family. The homeowners weren’t able to move furniture around easily or add more chairs for a larger group. 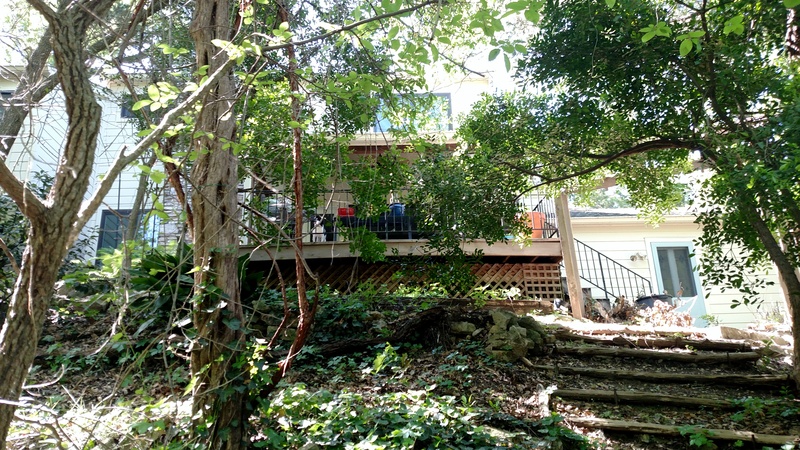 Second, the wooden railing of the original deck actually obscured the view of anyone seated on the deck — and also obscured the view of those looking out through the house’s many windows. The pickets, or balusters, were thick at 2×2″, and there was a 6″ horizontal board along the top of the railing, just at eye level for a seated person. 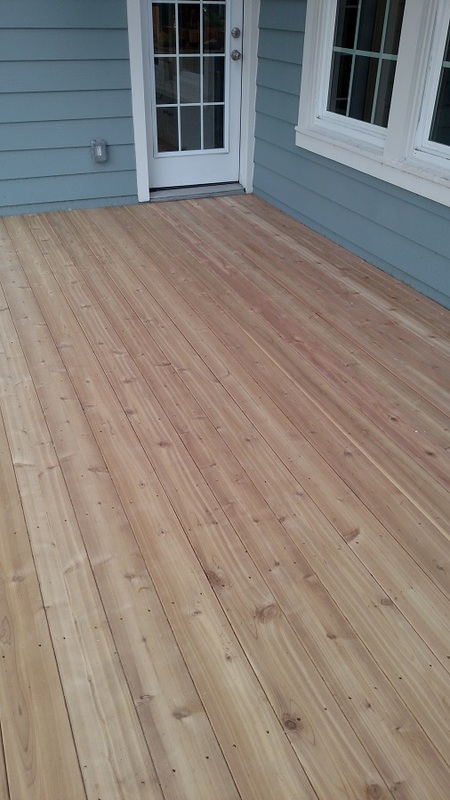 Third, the homeowners were ready to switch from natural wood decking boards (theirs were cedar) to a synthetic composite material. 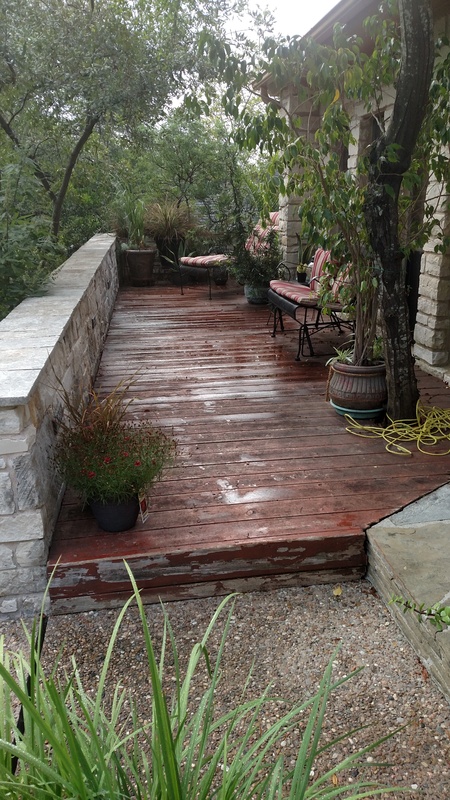 After years of performing deck maintenance, they welcomed the idea of a low-maintenance deck. 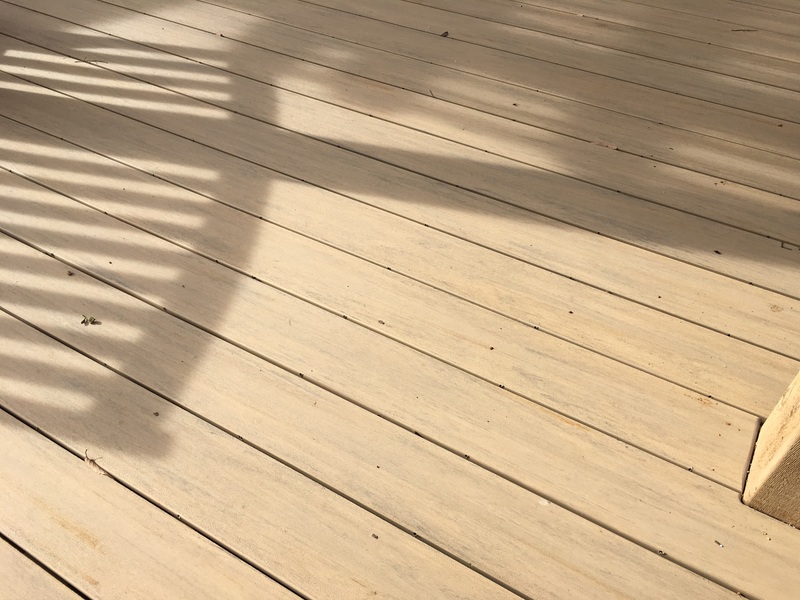 The composite materials on the market today are as attractive as wood but require less upkeep; at the time when the existing deck was built, fewer options were available. 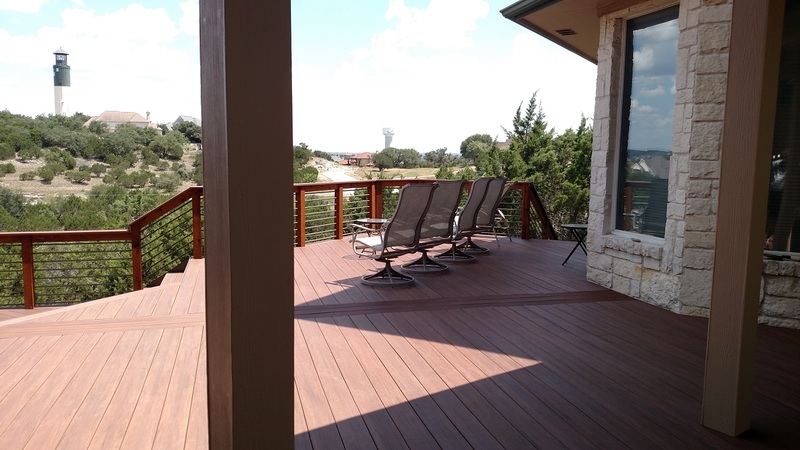 Premier deck builder Archadeck of Austin drafted a large, sweeping deck design that combined the two levels into one to achieve a much larger usable deck space – almost 1,400 sq. feet. 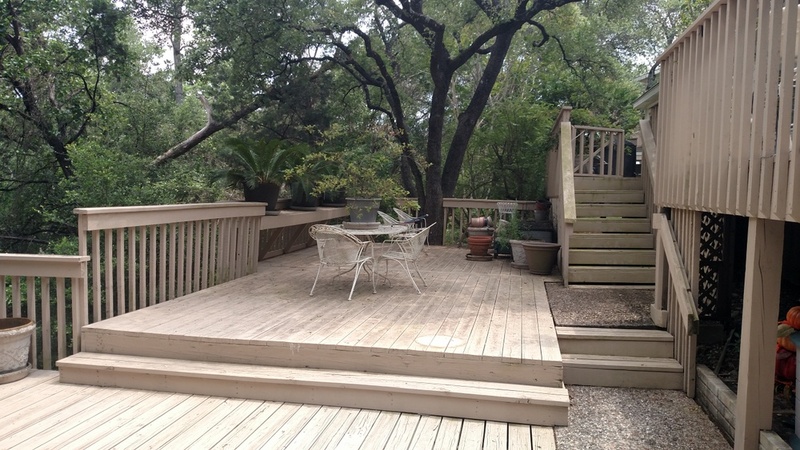 The angled shape of one side of the deck was designed to clear the root zone of a nearby live oak to ensure the deck will not impact health of the tree’s root system. Austin has “Critical Root Zone” mandates in place to protect trees of a certain size, called heritage trees. We were required to measure any trees near the deck construction. 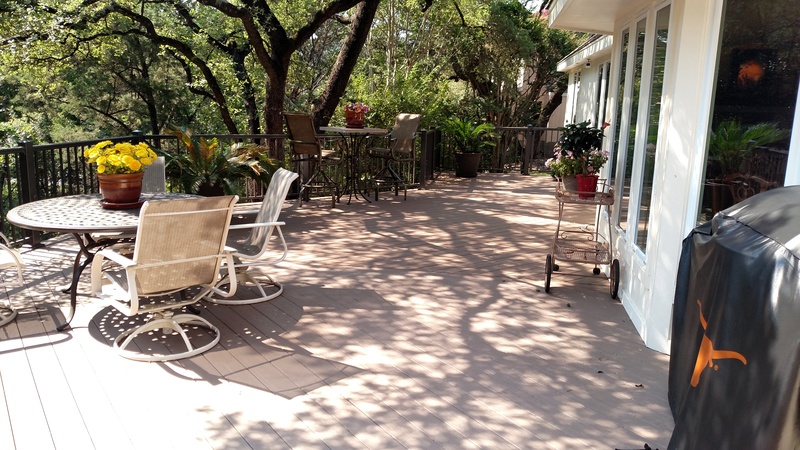 A tree with a circumference of 60” or more is considered a heritage tree, and as it turned out, the live oak next to this deck is large enough to be considered a heritage tree. The tree’s Critical Root Zone (CRZ) is calculated by a formula, and the CRZ is indicated on the engineer’s drawing by three concentric circles around the tree. The innermost circle indicates the first quarter of the CRZ. 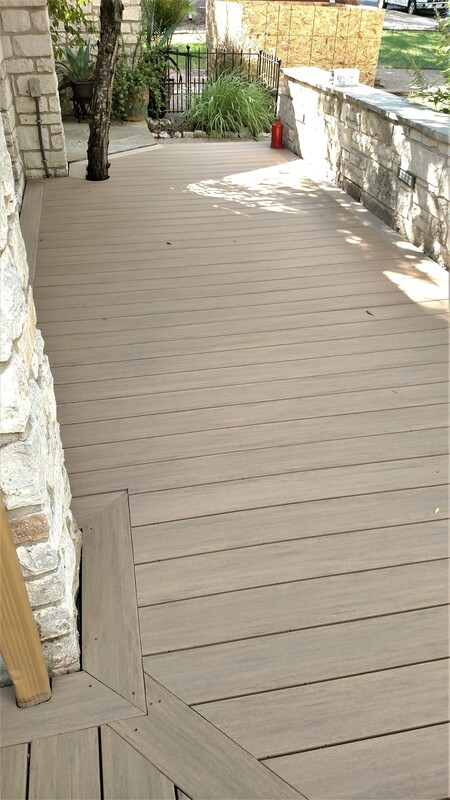 Within that inner circle, the new deck construction cannot impact the soil in any way. 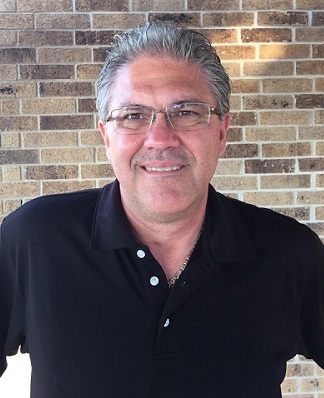 Between the first and second circles, called the second quarter zone, the new deck construction can impact the soil up to 4″ deep, but no deeper. Finally, between the second circle and the outermost circle, another formula determines the depth of soil impact allowed. 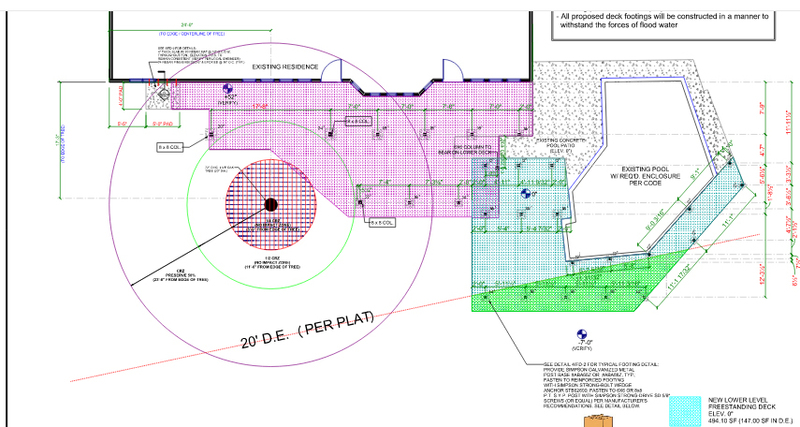 As you can tell from the drawing, every inch of the Critical Root Zone was mapped out in the design of the new deck. 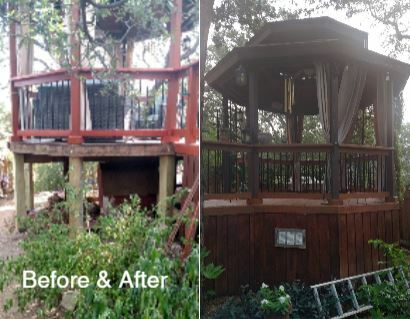 Because the entire deck structure needed to be replaced, including the footings and support beams, we performed a huge amount of demolition before we could install the new materials. 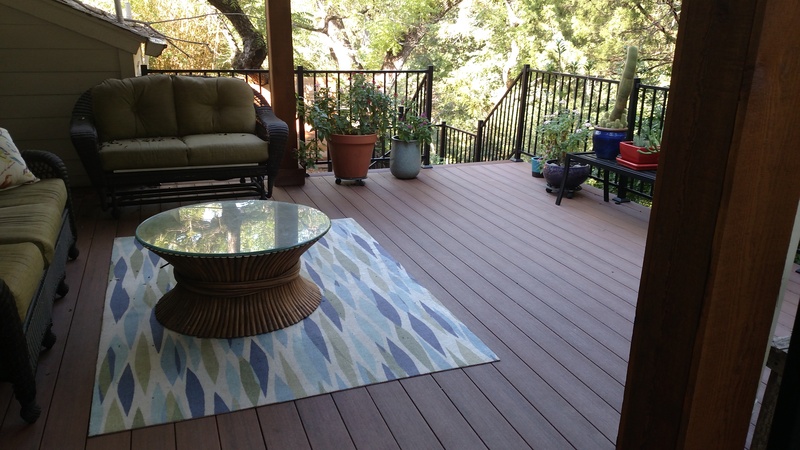 The homeowners selected AZEK, a cellular PVC decking product, for their new decking material. 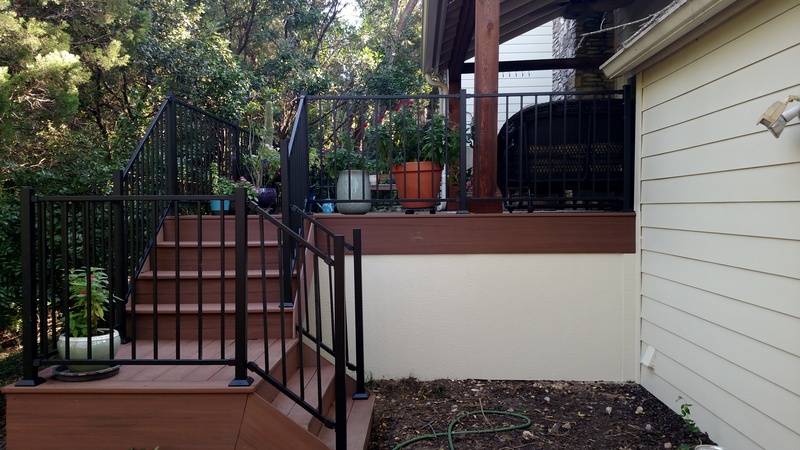 To complement the Autumn Chestnut color deck boards, they selected a Solutions aluminum railing system in bronze. What a difference! 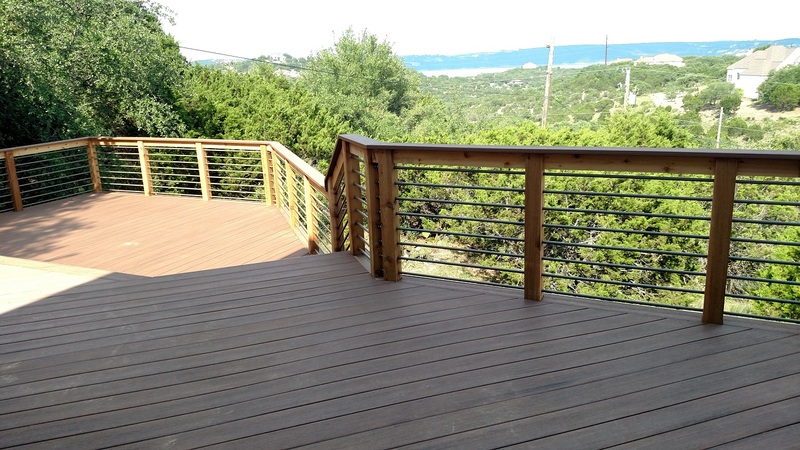 The new railings and pickets are darker and thinner, allowing a clean view from the deck and from within the house. 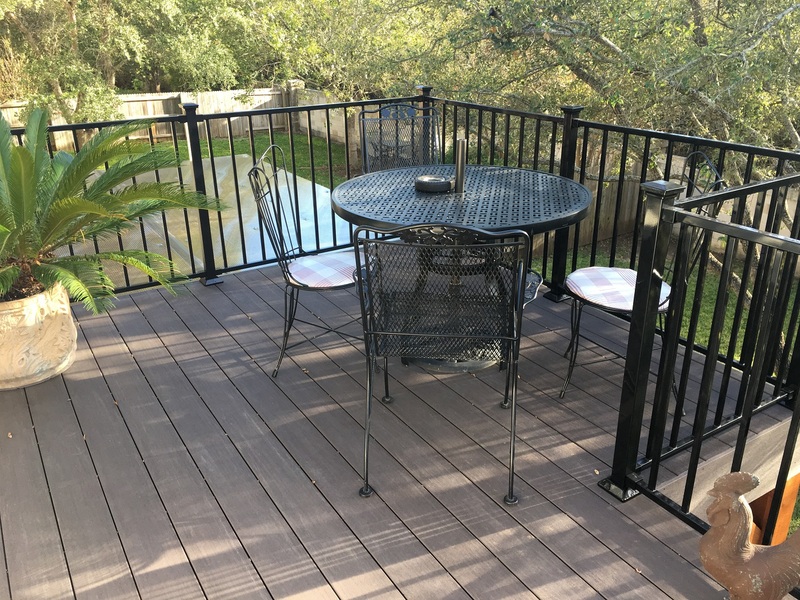 The Solutions aluminum railing is an excellent choice for another reason: it will never rust and has a lifetime warranty (as opposed to a 15-year warranty for steel). Retaining wall: We removed the original brick retaining wall and added a new wall in white limestone to match the house stone. 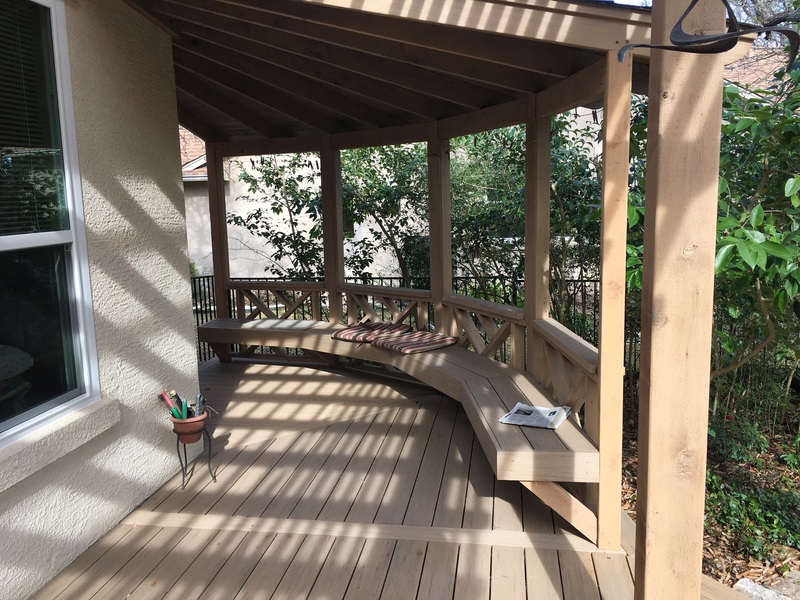 Under-deck storage: Instead of building a typical wood skirting around the deck, we framed out the deck’s underside, built a solid wall from AZEK and installed a door. Now the homeowners have lots of storage adjacent to the pool, and it’s invisible to onlookers – no clutter! 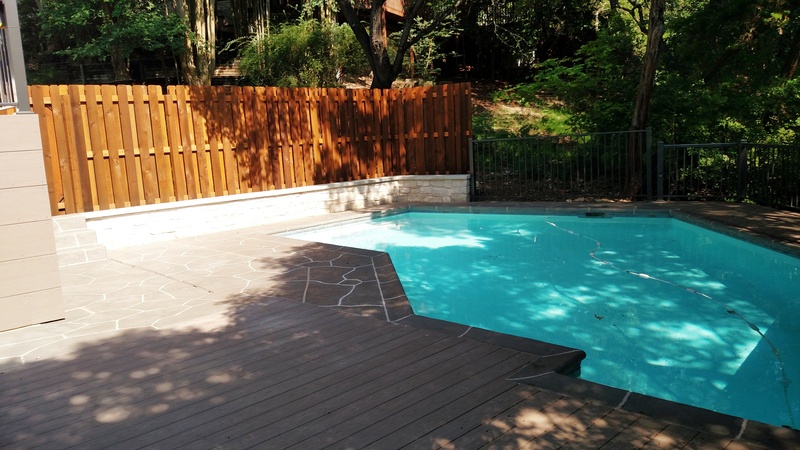 Poolside hardscape: A concrete overlay was applied by another company to cover the existing concrete surround in order to create a durable and attractive limestone effect. 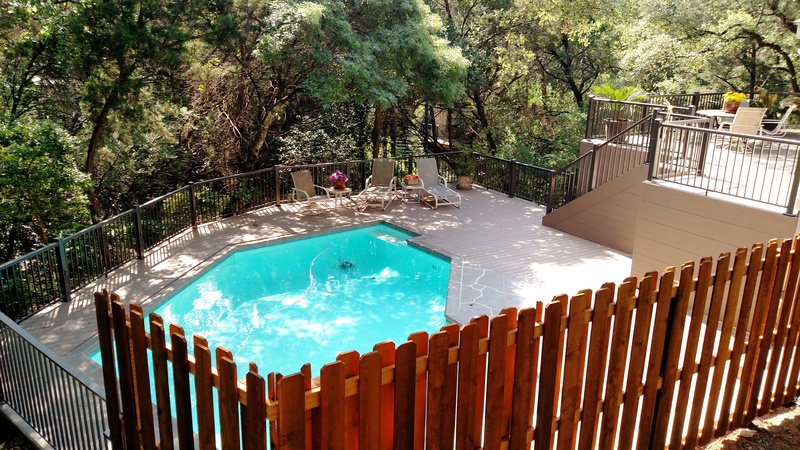 Poolside fencing: We replaced the existing wooden privacy fence with a board-on-board design, in cedar, and added custom gates. 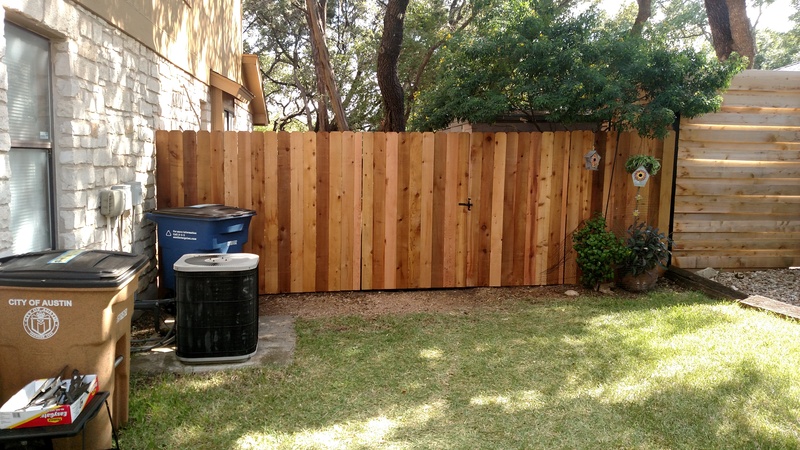 The board-on-board design keeps pickets from bowing, creates a sturdier fence in case of wind and is more attractive. 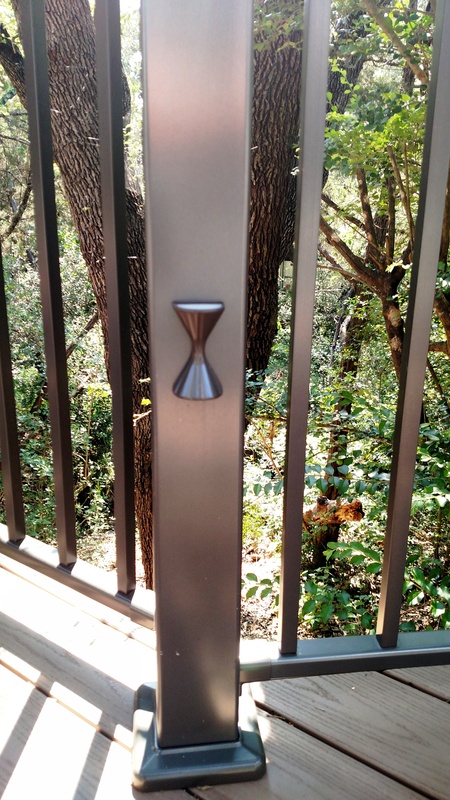 Deck lighting: Twelve LED lighting fixtures were incorporated into the aluminum railing posts along the deck and beside the stairs for ambiance and safety. Each small, teardrop fixture projects light in two directions – up the post and down onto the deck surface – and each LED uses only 1W of power! 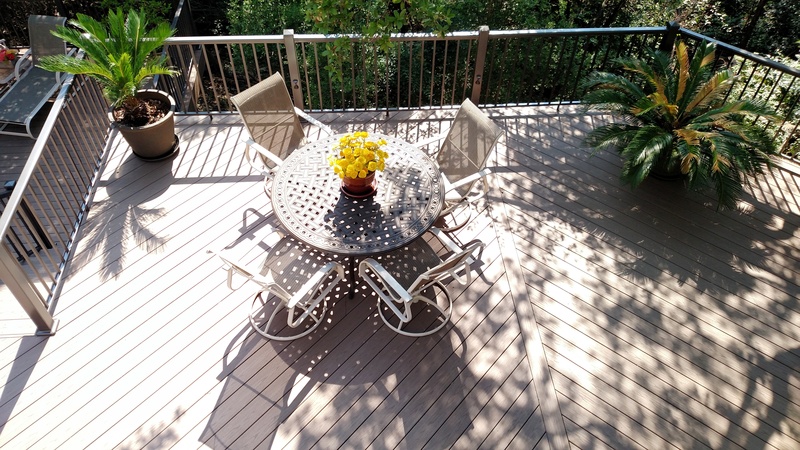 Is it time for a deck replacement at your house? 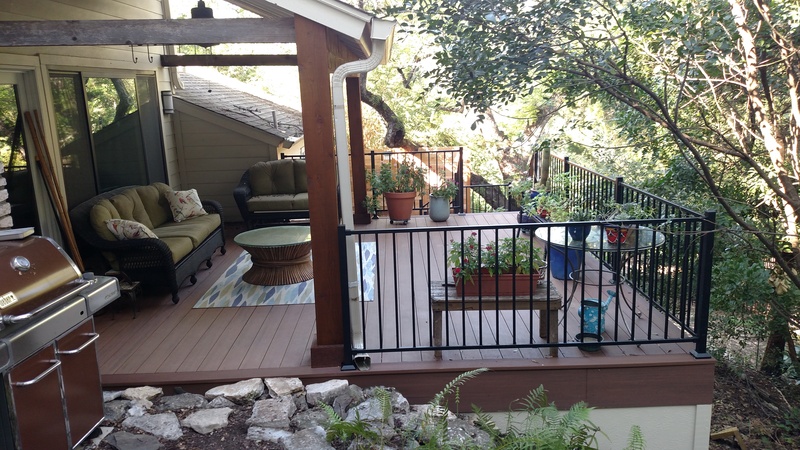 If you are ready to explore ideas for redesigning your outdoor living space, contact Archadeck of Austin today at (512) 259-8282 or via email at jim.odom@archadeck.net to schedule a free design consultation.